Carolina Vano Johnson grew up in Alcoy, Alicante, a city on the east coast of Spain, very close to the Mediterranean. She is the oldest of four children and spent her life divided among the two sides of the Atlantic Ocean. She grew up speaking Spanish and started taking English lessons as a young lady. She traveled as an exchange student to England and the United States to continue her education of English as a second language. In December 2010, she moved to Delaware to reside in Smyrna. She was married and built her life here. Carolina’s siblings, family and friends still live in Spain and Switzerland. Her and husband visit as much as they can. Carolina is a trusted companion in the fight against breast cancer in Delaware. She started working for the Delaware Breast Cancer Coalition in January 2013 as a part time bilingual navigator, scheduling women for their mammograms and providing them with interpretation if they did not speak English. She became full time in June 2013 and has been with the agency ever since. Today, Carolina spends her days identifying women who are in need of screening mammograms, many of whom may be uninsured or underinsured. She schedules them for mammograms on the Women’s Mobile Health Screening Van and will join the women who request interpretation for their appointments. Carolina also coordinates the scheduling of the mobile mammography van – bringing it to partner locations across the state to provide lifesaving screenings. She maintains a database, prepares reports for agency partners and enrolls and navigates women to financial resources to cover the cost of their screenings when they cannot afford them. If there is a barrier preventing a woman from getting a mammogram Carolina knows how to break it down. She says what she enjoys most about working for the Delaware Breast Cancer Coalition is being able to help women in need. As Executive Director of our state’s American Heart Association team, John works with his staff and countless volunteers to fight heart disease and stroke. To improve the lives of Delawareans, the AHA works hard to make the healthy choice the easy choice. Thanks in part to the work of his team, Delaware high school students are now receiving instruction on how to deliver “hands only” CPR before graduating. This statewide initiative was adopted just this past fall. “We’re still working hard to get all Delaware school districts the tools they need to get this work done,” said John. This year marks my third year as President/CEO of Easter Seals Delaware & Maryland’s Eastern Shore. I was excited to join this prestigious team of passionate people who care so deeply for the people we serve. Each day they touch the lives of so many people with disabilities through our many services, including those in Kent County. Last year, in Kent County alone, we served well over 900 people. I love my job because every day I see people in our programs who benefit greatly from our services, whether they are young children taking first steps towards their future in our therapy program, an adult with intellectual disabilities getting out in the community in our day program or seniors who are remaining safely in their home thanks to our In-Home services. Each individual is treated with respect and dignity. It makes me proud to work for such a great organization making a difference in our local community. I moved from Ohio to Delaware because I wanted the increased challenge and to help grow our programs to serve more people to make an even bigger difference. Our local Easter Seals is much larger than the one I worked at in Ohio. The range of services offered by Easter Seals was enticing to me. We are a leader in our field. My family are huge Disney fans and enjoy taking family trips to Disney World. Two of my children are in college, but they still ask when we are going to Disney World again. Our youngest son has settled into our home in Delaware. He is enjoying making new friends and the challenges of high school. My wife, Kathy, and I are excited to celebrate 29 years of marriage this May. My family loves that Delaware is at the heart of everything. There are so many opportunities available to us by traveling a short distance. I enjoy volunteering in the community. I have already gotten connected with the University of Delaware Health Sciences Program’s Advisory Council and serve on the Executive Committee of DelARF as the Secretary. Lois is a calm and reassuring presence in the lives of women (and sometimes men) newly diagnosed with breast cancer. Connecting with them in this way, on a personal level, is what Lois Wilkinson loves best about her work as program manager of education and survivorship in Kent County for the Delaware Breast Cancer Coalition, Inc. (DBCC). “Yes,” she tells them, “you’ll lose your hair and you’ll hate it. But it will grow back.” And “yes,” she may tell them, “having a mastectomy can be devastating. But with reconstructive surgery, and the healing power of time, your body and spirit will be restored.” She reassures these individuals that there is life after breast cancer. She knows first-hand, because Lois Wilkinson is a thirteen year survivor. Lois helps the newly diagnosed patients to connect with other breast cancer survivors, too, through DBCC’s Peer Mentor Support Program, pairing them with trained survivors who have shared similar diagnoses and life situations. She trains new volunteer mentors, and works with physicians and hospitals throughout Delaware to help those beginning their breast cancer journeys. Lois collaborates with physicians on educational programs to help those diagnosed with breast cancer make informed choices and decisions. She is also the key contact with surgeons and oncologists in Kent County to connect their patients with DBCC’s services. In addition, Lois coordinates workshops, educational seminars, and fellowship activities for survivors. She was instrumental in starting the popular “Nurture with Nature,” a program that takes survivors out into nature for time to unwind, heal, relax, to observe beauty, growth and renewal in nature, and to form bonds with other survivors. Lois originally came to DBCC as a volunteer, working on the Southern Lights of Life fundraising event, and became a member of the staff in 2004 – two years after her diagnosis. She is a graduate of the National Breast Cancer Coalition’s Project LEAD program and trained in the science of breast cancer. She was raised in Townsend, DE, is University of Delaware alum, and currently resides in Townsend. In her free time she enjoys gardening, kayaking and traveling. She serves on many community committees and is also a member of the Colonial Dover Rotary Club. He is a past President and current member of the Board of Directors of the Ronald McDonald House of Delaware, a former board member for the American Red Cross of the Delmarva Peninsula, a 2011 recipient of the Governor’s Award for Volunteerism and a University of Delaware HRIM Renaissance Award winner. Michael and his wife Kathy live in North Wilmington. They have two sons, Matthew & Jonathan, along with three Grandchildren: Ayden, Amoreena and Andrew. Away from work, Michael enjoys golf, the beach and time with his expanding family. Originally from Maryland, Terri Brisbane and her family relocated to Kent County in 2005 and immediately began to enjoy life living in Delaware. After a few years, she was presented with the opportunity to join Delaware Hospice as the Medical Account Executive for Kent County. Her focuses are many and includes education on the different programs that Delaware Hospice provides to physicians, hospitals, nursing homes, home health agencies, and other community partners in Kent County. She also enjoys the opportunity to meet with families to discuss how Delaware Hospice can help them, regardless of where they are in their journey of care. As a non-profit continuum of care provider, Delaware Hospice offers a wide range of services and programs such as Transitions, Delaware Palliative, Delaware Hospice, The Delaware Hospice Center, Bereavement support including New Hope. Each program offers resources and individual support to educate and provide excellence in end of life care. Terri says the sense of giving in our community is remarkable. She sees this in the volunteers who generously give their time to Delaware Hospice families and also in the many organizations that provide services for those in need throughout Kent County. Terri enjoys volunteering for the American Heart Association’s Heart Ball and is currently a Board Member with the Delaware End of Life Coalition. One of the advantages of working for Delaware Hospice has been the ability to work side by side with many exceptional clinicians. The compassion that she has witnessed not only for patients in the care of Delaware Hospice, but also for those families during many stages of their end of life journey has been inspirational. It is with this inspiration that Terri decided to pursue her own nursing degree and is currently a student at Delaware Technical Community College in Georgetown. There isn’t always a lot of free time, but when there is, Terri enjoys making the most out of it. It’s great to spend time with friends and family while enjoying the many outdoor activities that Delaware living has to offer. We would like to extend a special Thank You! Our Photo Shoot for Kent County was shot on location at the Old Statehouse Building in Dover, Delaware. Visiting this site for the shoot was like stepping back in time. The building is beautiful, and the lighting in this facility was perfect for photographing. 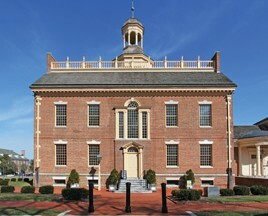 The Old Statehouse is a historic state capitol building located on The Green at Dover, Kent County, Delaware. It was built between 1787 and 1792, and is a two-story, five bay, brick structure in a Middle Georgian style according to Wikipedia. This beautiful historic structure is located at 25 The Green, Dover, DE 19901. The building is open from 9am-4:30pm. The Old Statehouse opened in 1792, and is of the Georgian Architecture, and well worth visiting if you are doing a day exploring the history of Dover, and Kent County. For more information please call 1-302-744-5054, or go to www.history.delaware.gov. Mike Baker is the founder of C.M.Baker Photography with over 25 years experience. His photography ventures have been quite diverse. Throughout the year you may find him shooting a wedding, a Quinceañera, in the pits of a NASCAR race at Dover Downs and now at front stage at the Firefly Festival or flying over doing aerials. Giving back to the community has always been an important part of it all. Mike was awarded “Volunteer of the Year” from CDCC (Central Delaware Chamber of Commerce) in 2005, “Volunteer of the Year” from Kent County Tourism 2010,”Chairman’s Outstanding Partnership Award from CDCC in 2010 along with “Business Person of the Year” from CDCC in 2008. Since 1997, Mike has been the “official” photographer for the KC Heart Ball and for the “Go Red” in Kent County since it’s onset. Some of the past and present organizations have been: MD Kidney Foundation, De Breast Cancer Coalition, Various De Fire Companies, Bayhealth Foundation, Beebe Hospital, Dover Air Force Base, Autism DE, Relay for Life, MS Bike to the Bay and the Amish Bike Tour, to name a few.